Hydroplaning, also known as aquaplaning, happens when a layer of water builds between the tires of a vehicle and the surface of the road. When this build up occurs, the vehicle will lose traction and prevent the vehicle from responding to control inputs. Control inputs are steering, braking and accelerating. The loss of this control basically means your vehicle is no longer in your control and there is a possibility that you may be in an accident. Know what hydroplaning is and how it is caused. 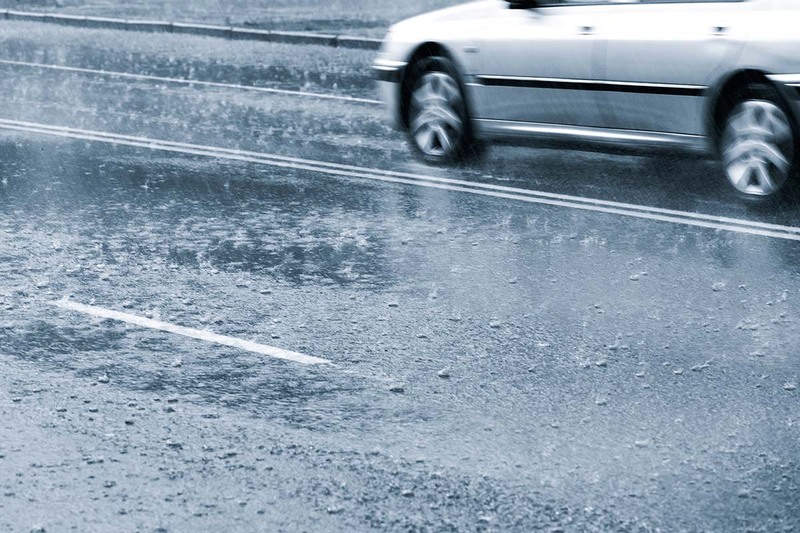 Hydroplaning is when there is enough water on the road that it will not allow your tires to channel the water away. This could be as little as a few inches. This results in the tires losing friction/contact with the road. Keep good tires on your car with that appropriate pressure in them. Slow down when it is raining. Avoid puddles. It is hard to judge how deep they are, and how much water there is in them. It is best to avoid them. If you can’t avoid them, go through them slowly. Don’t use your cruise control feature on your car. If you are using this feature in the rain and decide to hit the brake to end the use of the cruise control that could cause you to hydroplane. Do not slam on your brakes. It may make your brakes lock up, you to lose traction and control over your vehicle. Instead, ease off the accelerator and your car will find traction. If you are behind another vehicle, follow their tracks. Their tires will displace the water, so yours won’t need to. However, remember not to follow them too closely. We have had some very wet roads in Kentucky with heavy rain and melting snow. The best way to prevent a car accident is to slow down and be aware of the condition of the road. There are no winners in car accidents. Prevention is truly your best option.